DLRP Magic are reporting that a new show Goofy’s Summer Camp will open on the 4th July at The Chaparral Theater in Frontierland. Goofy’s Summer Camp will replace the nine-year-old Tarzan Encounter which closed earlier this year. Rumours suggest that the waterfall effect of the Chaparral Theater’s old Pocahontas show could make a return. The new show will run for the entire Summer season, until 30th August 2009. Hello readers of the Supercalifragilisticexpialidocious blog. This weekend I took the decision to rename the blog to Salon Mickey. The reason for the change is simple, its less of a mouth full to say and type. So what is Salon Mickey I hear you ask? 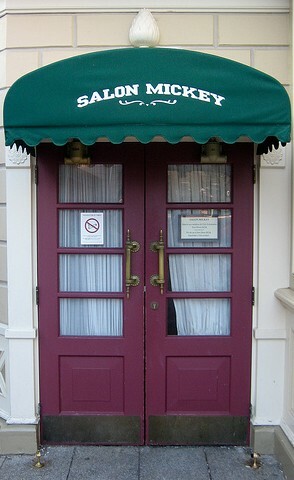 Salon Mickey is a private lounge at the Disneyland Park in Paris. 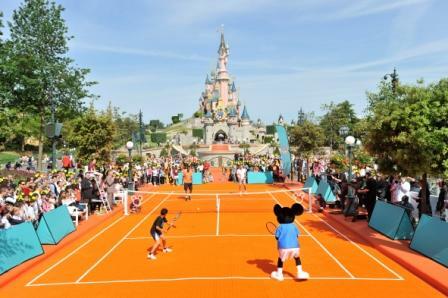 It originally opened as a welcome area for VIPs, but was converted to accommodate shareholders of Euro Disney S.C.A. The lounge is located at the entrance to the park and allows Euro Disney SCA shareholders to bypass the regular turnstiles, and offers complimentary pastries and beverages in a turn-of-the-century atmosphere filled with references to Walt Disney’s life and career. All the old posts have been moved to the new blog. There is an article on France Today about Nicolas Sarkozy’s future expansion plans for Paris. One of these includes a train link between Charles de Gaulle Airport and via Marne-la-Vallée. The French President has called for an 80-mile addition to the urban transit system, a combination of elevated and underground trains, to raise the level of service and reduce highway traffic throughout the sprawling region. The most interesting aspect for a visitor would be the big outer loop around the east of the city that would link Charles de Gaulle (CDG) airport north of the city with Orly airport in the south via Marne-la-Vallée, the home of Disneyland Paris. The first half results for 2009 have been published and here are the high lights. • Net loss increased by € 42 million to € 85 million due to lower revenues, as costs and expenses remained stable. “We achieved record attendance for the first semester and strong occupancy levels in our hotels. Our sales initiatives are delivering results in an increasingly difficult economic environment. Our revenues decreased this semester which negatively impacted our results. This decrease was mainly due to a decline in real estate activities as well as a shift of the Easter vacation period into the second semester. Our Spanish and English markets declined significantly during the first semester, partially offset by a strong performance from our French market. We reacted to these changes by increasing our sales initiatives, while at the same time continuing to pursue disciplined cost management. Resort operating segment revenues decreased by 4% to € 553.9 million from € 577.6 million in the prior-year period. The Group’s Resort business is subject to the effects of seasonality with the first half of a fiscal year typically generating less revenue than the second half. Results in the First Half have also been unfavorably impacted by the shift of the Easter holiday in some of our key markets from March in the prior-year period to April in the current fiscal year. Theme parks revenues declined by 2% to € 309.6 million from € 316.4 million in the prior-year period, primarily resulting from a € 1.66 reduction in average spending per guest to € 43.01. This decline was partially offset by an increase of 111,000 in attendance to 7.1 million. The reduction in average spending per guest reflects lower spending on admissions and merchandise. The increase in theme parks attendance was driven by higher guest visitation from France, partially offset by Spain and the United Kingdom. Hotels and Disney Village revenues decreased by 7% to € 219.6 million from € 235.9 million in the prior-year period, due to a 5% decline in average spending per room to € 187.16 and a 2.7 percentage point decrease in hotel occupancy from 88.5% to 85.8%. The decline in average spending per room principally reflects incremental promotional offers. The reduction in hotel occupancy resulted from 34,000 fewer room nights compared to the prior-year period primarily driven by fewer guests visiting from Spain, the United Kingdom and Germany partially offset by more French guests. Other revenues, which include participant sponsorships, transportation and other travel services sold to guests, decreased € 0.6 million to € 24.7 million.